Professor Tim Minshall, the inaugural Dr John C Taylor Professor of Innovation, has become the new Head of the IfM, taking over from Professor Andy Neely. Professor Minshall joined the IfM in 2002 as a member of the Centre for Technology Management. He established his own research group within the Centre focusing on technology-based enterprises and became a University Reader in Technology and Innovation Management in 2013. He has also been a recipient of the University’s Pilkington Prize, awarded to its most exceptional teachers. 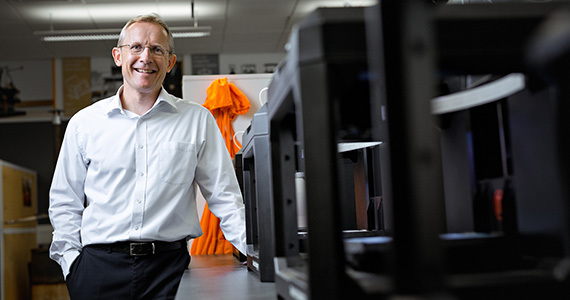 Most recently, he has been leading research into the industrial adoption of 3D printing and has been part of the team developing the UK’s National Additive Manufacturing Strategy. Since March he has been Deputy Head of the IfM. Throughout his time at Cambridge, Professor Minshall has played a very active role in the development of innovation and technology management activities across the University. He also works closely with companies in the Cambridge cluster, the largest and most successful technology cluster in Europe. Professor Minshall is taking over from Professor Neely, who was appointed the University of Cambridge’s Pro-Vice-Chancellor for Business and Enterprise in March to lead the University's strategy to enhance and develop its engagements and partnerships with industry and commerce, and the wider enterprise economy in the region. Professor Minshall said: “Becoming Head of the IfM is a huge privilege. We want to see IfM continue to be at the forefront of developing new thinking about manufacturing, putting those new ideas into practice today, and educating the manufacturing leaders of tomorrow"
Professor Neely remains Director of the Cambridge Service Alliance based at the IfM and will continue to have strong ties to the IfM through his work leading industrial engagement for the University.